Reasons for concern: This plant is now naturalized over most of North America. 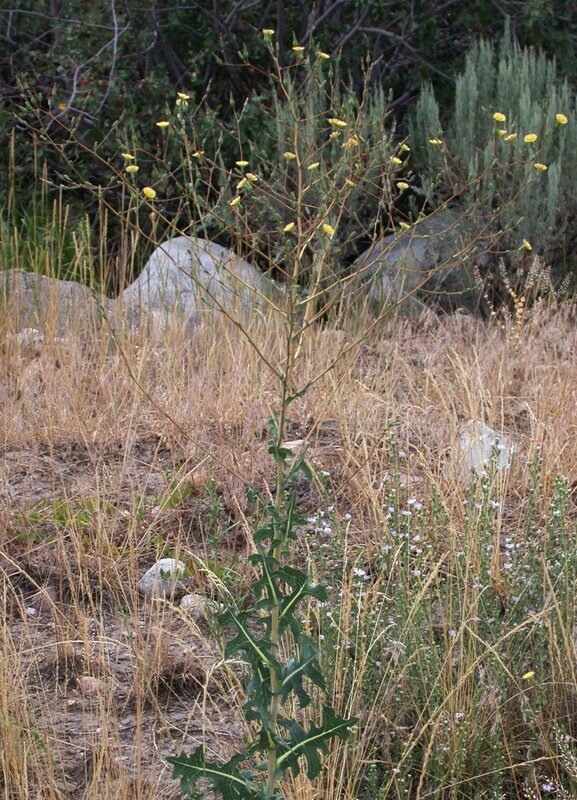 It can easily take over roadsides, abandoned fields, and other disturbed areas, significantly reducing native plant diversity and the pollinators which are dependent on them. Botanical description: Tall, erect herbaceous plant. Leaves: In rosette stage, leaves are light green, oval shaped, with slightly wavy margins (similar to dandelion leaves). Leaves on stalk have no stem, are twisted at base, and are 2 to 10 inches long and ½ to 3 inches wide. Arranged alternately, generally deeply lobed with prickly edges. Row of spines runs along underside of middle rib. Stem(s): Usually one. Following rosette stage, stalk grows 1 to 5 feet tall, lower third of which occasionally is covered in small spines. Prickly. Stems produce milky sap when broken, branching only in upper flowering portion. Flowers: Numerous yellow flower heads, borne on branching stems at top of stalk. Blooms contain only ray flowers, ½ to 3/4 inch in diameter. Blooms July through September. Seeds: Flattened, tan seeds, each attached to silky parachute. Viable up to three years. Where it grows: Roadsides, agricultural land, yards, gardens, disturbed sites. Elevations 2,500 to 8,000 feet. Weedy characteristics: Seed production can be from several hundred to tens of thousands per plant and mature seeds germinate immediately. Parachute on seeds enables it to travel into uninfested areas by wind. It is drought tolerant. Control strategies: Remove plants manually, being sure to remove roots; till or hoe before plants flower. Disturb soil as little as possible. Step down disturbed soil. Plant desirable species to outcompete invasives. Frequently monitor previous infestations for new growth.